I had the itch to quite literally “get outta town” the past two weekends, to take advantage of this beautiful state we’re living in. 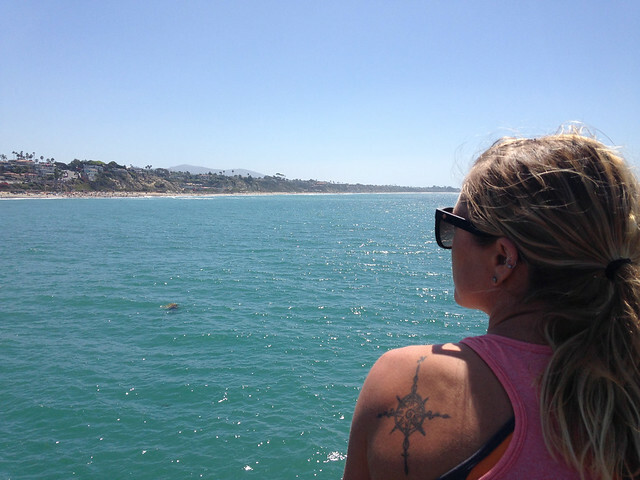 On Labor Day Monday, we took a short day trip up to San Clemente so I could run somewhere new. The waterfront has a nice 3-ish mile out-and-back along a boardwalk/paved path, and if you get there early enough, it isn’t too crowded and offers shade from the bluffs. I added on going north to hit 11 miles, but the northern portion along the road isn’t too inspiring. We tried Cafe Rae for breakfast afterwards, and I’d go again, but the Riders Club Cafe is still a favorite for burgers (and of course, Pizza Port for beer and pizza). Watching fishers and surfers on the pier, post-run. 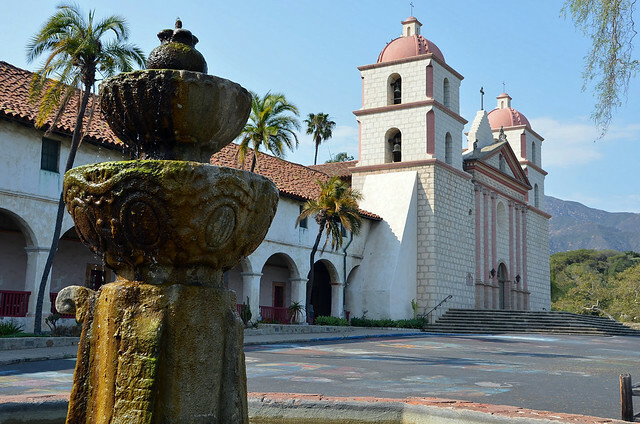 This past weekend we took a friend up on the offer to crash with him and his girlfriend, who recently moved to Santa Barbara from San Diego earlier this year. 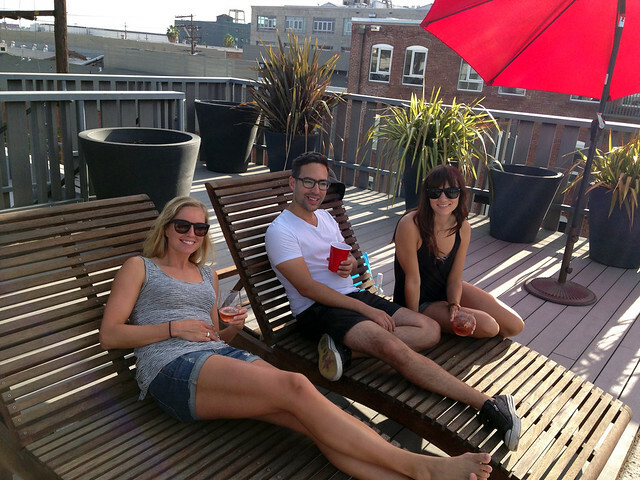 It was a spontaneous trip, and they were gracious and relaxed hosts. He also happens to be training for an Ironman in November (Cozumel), so made the ideal training buddy as well. We arrived late Thursday evening, and on Friday morning, I joined him for a hilly run around his neighborhood and down to the water. 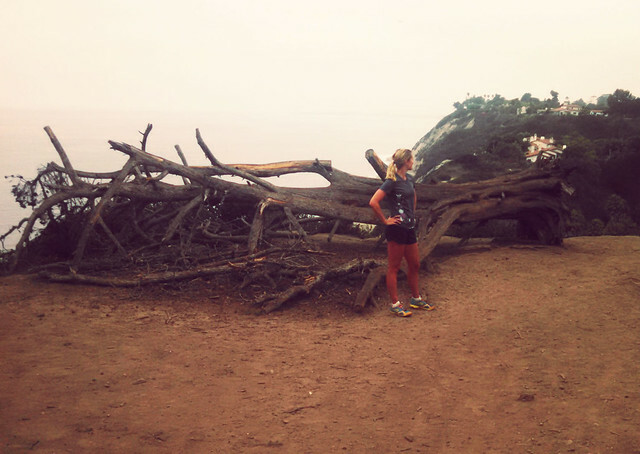 Morning run along the cliffs. 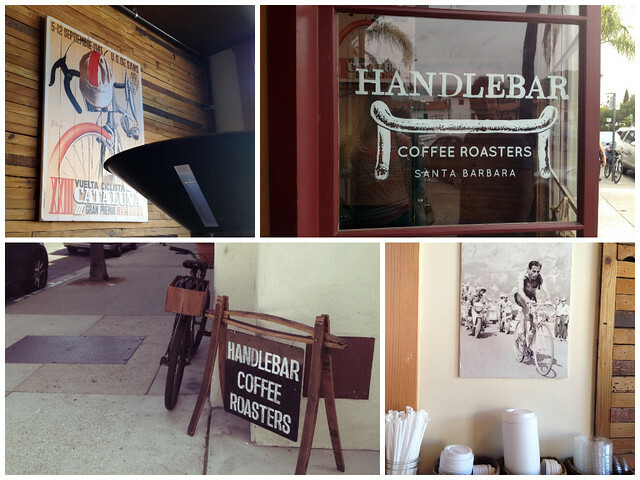 After my run, Mark and I whisked away to Handlebar Coffee to work. When our batteries ran out, we took refuge at the Santa Barbara Public Library. (In short: we traded great coffee, hipster-style people-watching, and wifi, for outlets, silence, and vagabond-style people-watching.) 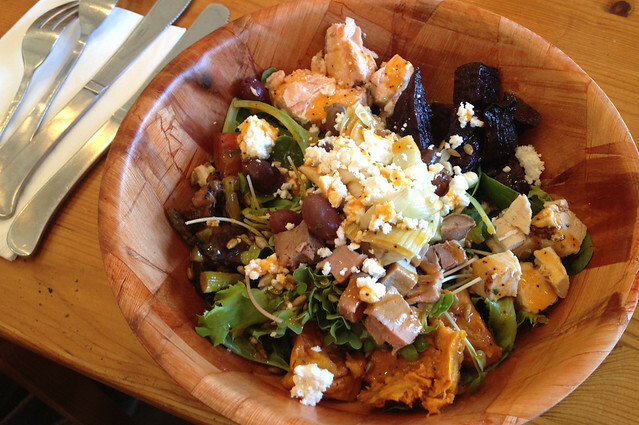 We had lunch at Savoy Cafe and Deli on Figueroa St., which lived up to the salad bar hype promised by Yelpers. In-house roasted beef, amazing caponade, and homemade dressings? Yes! Mark had a pastrami sandwich, which was delicious as well. I love me some bicycle-themed coffee. Couldn’t get enough of that salad bar. Friday evening we hit the (very choppy!) 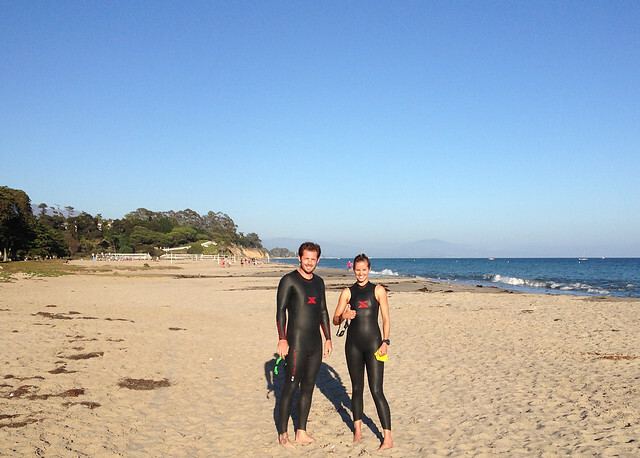 open water for an easy half-hour swim while the non-triathletes walked the dogs. Because the beach showers had been capped due to the drought, I had the privilege of doing Friday night on the town with natty, salty hair and a smelling like the ocean. Good thing it’s a hippie town, sort of. That night we hit the “Funk” zone, a stretch of East Yanonali that runs between Santa Barbara Street and State Street. It’s a fairly recently gentrified arts district type area just north of Stearns Wharf, lined with galleries and wineries. It reminded me of Austin’s 6th Street, minus the food trucks. We tried to get a table at Figueroa Brewing Company (which had live bluegrass! ), but there was a private party so it was packed. Instead we hit Union Ale Brewing Co., which was alright, but not worth more than a passing mention. Then we hit American Ale for beer and craft cocktails, which has a great list, and barrel-aged cocktails to boot. 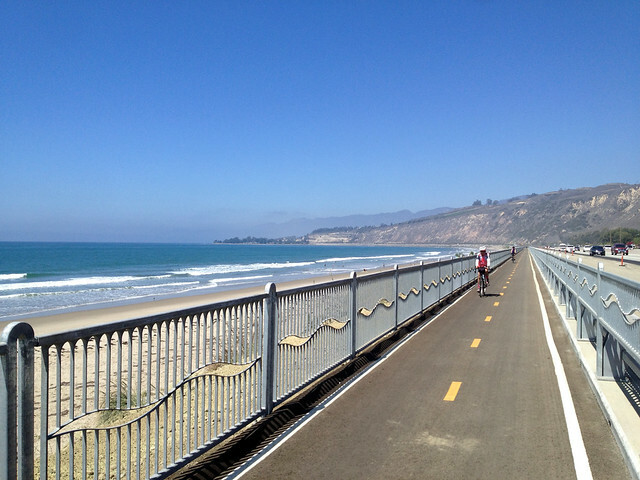 At about mile 40, you hit the Ventura River Trail bike path, which is an interesting route that takes you weaving through active oil derricks and the surrounding industrial area. You can get going at a surprisingly good clip through here however, and we even found a pace line to join. We found the coast again at mile 45, to be greeted by a enthusiastic headwind for the remaining 30-odd miles. It reminded me of my Ironman in South Africa, where I averaged about 12 mph over the entire 20-mile stretch back to town. Twice. Thankfully, beautiful beaches (like the ones at Faria and Rincon) made up for the struggle, and the bustling towns of Carpinteria and Summerland delivered us safely back home before we were completely out of energy. 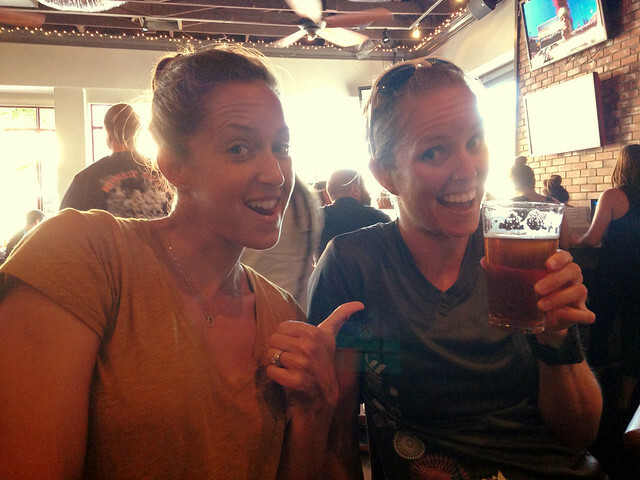 I snuck in a 30-minute transition run, ending conveniently, at the Santa Barbara Brewing Co. where Mark had serendipitously run into friends from San Diego. I never drink beer (or any alcohol, for that matter) right after a hard workout, but that day, I learned that a fro-yo sugar rush with an IPA chaser can be, quite simply, magical. Becky and sweaty me at the bar. After all that nonsense, I needed good coffee in a bad way, and so we hit an old favorite, The French Press before heading back to get cleaned up for dinner. This is always a good pick if you’re in the area, and they now have two locations. 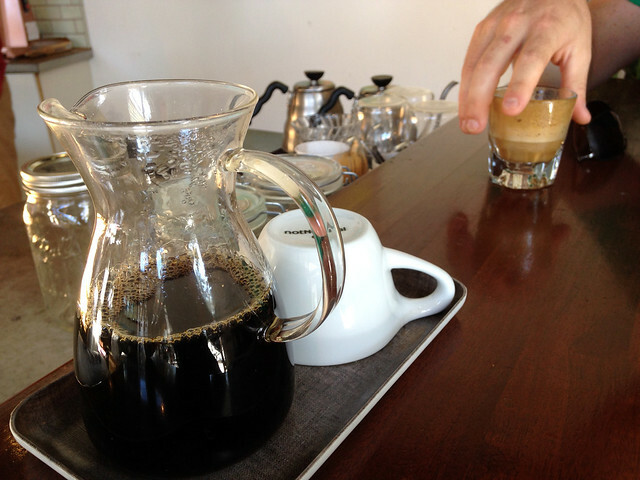 Ethiopian pour over for me, Gibraltar for him. We had planned to grill at home that night, but everyone was wiped so we headed back downtown to Eureka!. They have a great beer list (1500 hopped Pale Ale from Drake’s for me), and excellent food (I had the Fig Burger, with fig jam, arugula, goat cheese and bacon). It was the perfect way to restore energy and fuel up for what would turn out to be quite a challenging Sunday. We were going to run long Sunday morning, but my friend’s knee pain flared up so I opted for more bike miles. Friends had told me that I just had to do the “epic” Gibraltar climb, and so I decided to tackle it solo early Sunday morning. It lived up to the hype and the suffering, and then some. 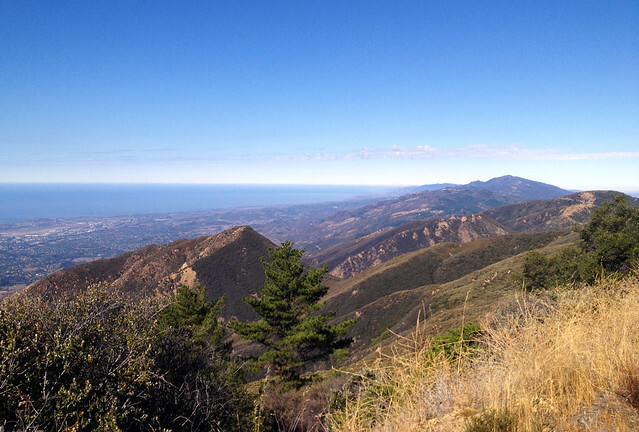 From the corner of West Mountain and Gibraltar (mile 5 on my route), you climb 3000 unrelenting feet over grades of 7-20% to deliver you to Angostura Pass, where you then veer onto Camino Cielo. (Don’t take the right hand turn onto Gibraltar at mile 12 or you’ll end up with a much longer day!) 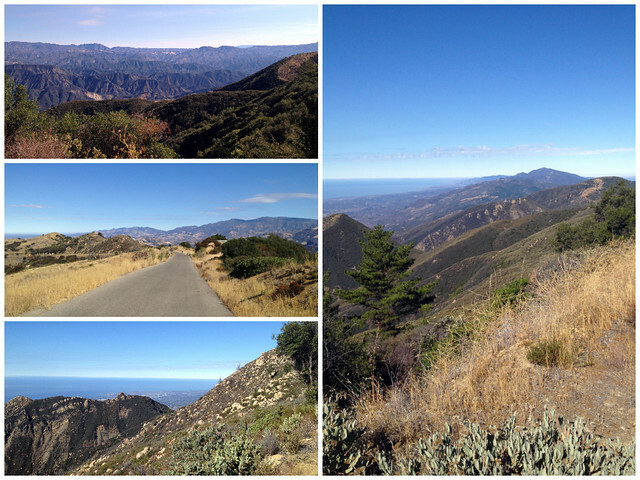 The 6-8 mile or so ridge you ride at the top is among the most beautiful routes I’ve ever done on two wheels. 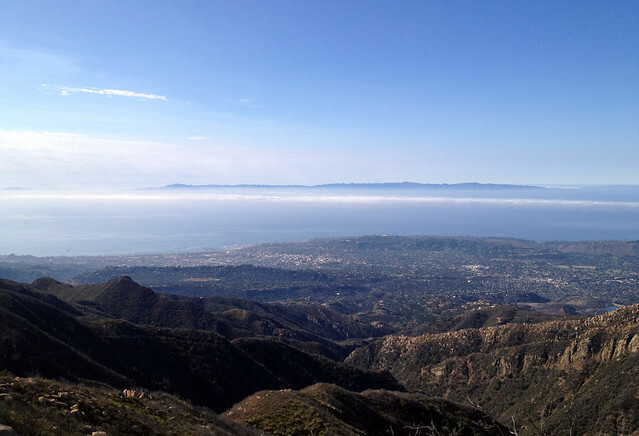 You can see for miles out over the peaks of Los Padres National Forest, and out to the Channel Islands on the west side. From there it’s another 4 or 5 miles of descending until you hit the mercifully flat roads of Santa Barbara again, where I full-on bonked (I foolishly only brought water, thinking it was a “short” 30-some odd mile ride). To top it off I got a bit lost in town at the end, which is always nice when you’re running on fumes. The 37-mile route took me 3.5 hours, which is a 10 mph average. But I climbed almost 6,000 feet in a morning, so I’m putting that in my own pipe and smoking it. I was zonked, but craving the water, so we finished off the weekend with a 20 minute ocean swim and lunch at Julia Child’s favorite Mexican joint, La Super-Rica. The house made tortillas are to die for, but if I’d known how tiny the servings were, would’ve ordered 5 more! We were then packed up and on our way to LA, for a quick visit (rooftop rosé, homemade burgers, and pie at Pie Hole), before driving home under the stars. Rose on the rooftop of my cousin’s new loft in the Arts District. Whew! That was a long one. Now it’s back to real life, after a weekend in the “American Riviera,” where I fell in love with the food, the Spanish architecture, and the neighborhood-y vibe and greener-than-San-Diego tree-lined streets. I’ll be back. Great read, Jen! Sounds like a wonderful time!! Silence at the library? Hardly! you must have meant The Friendly Giant :) “Look up. Waaaay up” –Right? And he plays recorder and has a friend giraffe named Jerome. Ah! Got my nostalgic television references mixed up! Totally confused the two. Thanks for the correction Andrea!